Remember that survey that y'all filled out for me back in January? 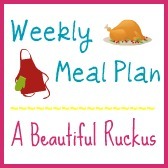 One of the things that was requested several times were posts with our meal plans. I really didn't think our meal plans would be all that interesting...and then I realized that I really enjoy reading others' meal plans to gain a little inspiration! So no promises that I will successfully get this post up every week, but I'll sure try! If you are looking for some of the strategies that help us decide what to eat every week, make sure you check out our Meal Tip Series! What are you having for dinner this week? I'd love to get some inspiration from you! Yes, they do! When we are having something that I know they don't love or that is new, I always make sure to include something I know they like as well. My theory is that if I keep introducing new and different foods to them as kids, it might help keep the pickiness to a minimum later on. ...so far that hasn't proven true with Abby, but I'm not giving up yet! Well...I don't exactly have a meal "plan" but for our family of 7 this last week we made up 60 burgers and buns (froze) and 3 doz. bacon, potato and egg burritos. I also have found that it is very cost effective to buy rotisserie chicken at Sam's and debone and freeze. (Walmart is $1 more per Chicken and they are considerably smaller) Then I have chicken ready to go for salads, nachos, tacos...whatever. Takes 2 mins to thaw out a qt. bag in the micro. Plus, their chicken is gluten free..if that matters to anyone. A rotisserie fryer is $4.99 and it's all cooked for you...so much less mess than cooking 4 big fryers at home plus having to clean up the mess. Anytime I cook...savory or sweet (mostly cookie dough), I double, triple or even quadruple so that I can freeze and have ready on busy days. Really helps. Also...I've made our own laundry detergent and really didn't care for it. I guess our kiddos get their clothes much dirtier than others, but I find it does not take out stains very well...even when they have been pre treated with stain remover. I gave it another try, but this time, after I make a batch of the homemade stuff, I then pour in a large bottle of the commercial laundry detergent of my choice and mix well. It still cuts the price WAY down, and I find it cleans much better. Sure whish I had had your cooking/shopping wisdom years ago! You're doing an awesome job!! Homemade laundry detergent is on my list of things to try! My SIL gave me a sample of her DIY laundry detergent that I"m looking forward to trying this week!